Puddles of Myself: Puddles of My Mad Men Season Six: "A Tale of Two Cites"
Puddles of My Mad Men Season Six: "A Tale of Two Cites"
On living, dying and the James Salter bandwagon. I jumped on the James Salter bandwagon about a month ago. James Salter has been one of the best American fiction writers for nearly 60 years, but he is garnering attention now due to the fact that he just released a new novel, All That Is, and because, at 87, he is reaching that stage of his life where media outlets and lovers of literature heap on their long overdue appreciation. And I’m not better than anybody else, because I have slept on Salter as well. He’s known as the “writer’s writer” and I would say that is an accurate term if it really meant anything (just like saying Louis CK is a “comic’s comic” doesn’t truly mean anything). Salter’s prose, to me, is reminiscent of Virginia Woolf, if she had the restraint and masculinity of Hemingway. Again, that doesn’t really mean anything— because every now and then he’ll turn a phrase that is straight out of Thomas Wolfe or even Joyce—those are just the terms I find myself using to describe Salter’s writing. I just finished reading Light Years, which is considered Salter’s greatest work. Light Years is one of the best books I have ever read and might now be my fourth or fifth favorite novel of all-time. It is a work of art that is so beautiful and so true that at some points it actually hurt me to read it. I would read it on the subway and slightly chuckle as Salter’s narrator—a godlike entity not all that far off from a Tolstoyan narrator—made sweeping, accurate statements about a specific type of human behavior; and then moments later I would feel all the energy drain from my body as he described a father’s feelings for his daughter so well, that I, nowhere close to being a father, could completely understand—and could imagine my father thinking the same things as he watched my sister grow, I could see the heartbreak and pride of my sister’s very existence through my own father’s eyes. This is what the best kind of literature should do, and I’d feel drained because I’d think that I would never be capable of rendering anything as beautiful and true. However, I’d compose myself and, full of resolve again, make note of what a good writer does, vowing to do my best to achieve the same effect in my own work. Light Years is basically the story of an upper middle class husband and wife (named Viri and Nedra) who know the finer things in life. Who have two beautiful daughters (Franca and Danny) and a beloved dog with pointed ears named Hadji. They wear oat colored sweaters and camel skirts and buy a pony and have picnics in the Hamptons. They have friends named Arnaud and Eve and Robert Chaptelle. They grow apart, have affairs with people named Jivan and Kaya. New York decays but they never abuse each other. They get divorced, think about death and the loss of youth and then they die. Years pass; at one point, a whole, particular month of August passes in one, beautiful paragraph that completely caught me off guard. Again, it is an amazing novel—simple and complex and beautifully written, a novel that leaves you pondering how you fit into your own life and into the experience of life as a human being. What does this have to do with Mad Men? After watching “A Tale of Two Cities” in the wake of reading Salter’s novel, I can’t help but think of the two sagas as some kind of bedfellows. We have watched Don grow, regress, attempt to change and then continue to regress as a character over nearly ten years. He has felt estranged from his children and yet also shown an endearing amount of compassion and tenderness for his daughter. We have seen him as a serial adulterer and also a vulnerable, desperate lover. We’ve seen him through divorce, through the depths of the deepest and most depressing alcoholism. And we’ve watched him build himself up again, remarry and now distance himself from his own wife. All the while, the world around him is changing—things are becoming more complex; a certain era or way of thinking about life is dying and another one is rising. We may or may not see him die in this narrative, but we know he is going to. And, basically, we can say the same thing about all of these characters. Peggy and Joan’s interaction on this week’s episode was just another rich chapter in their history together. Peggy and Joan have been foils since the series’ outset. They harbor certain resentments towards each other, but also a certain amount of admiration as well. They are both competitive and both think that their way of being a woman is more right than the other’s. But they have known each other, and no matter if Peggy disagrees with the way Joan conducted herself with Avon, she wasn’t going to let her simply get railroaded by Pete and Ted. And yet, will Joan ever truly get the respect she wants? Will Peggy ever find that thing to satisfy her? Have someone to understand her besides Don? Her private heart must still harbor some love for Ted, right? It’s the same for Roger Sterling. Even though he espouses some helpful advice when he tells Don that through his therapist he’s learned that all life is about is understanding who you are so that you can then love yourself. Yet, we just watched last week as he failed to take his own duties as father and grandfather seriously (though his daughter to overreact just a bit). Roger’s decision to understand himself in order to love who he is makes sense, but he never truly grows. He’s still going to be the same man that takes joy in making "short" jokes to Danny Siegel's face; but if that’s who he accepts himself as, then that’s fine. It’s probably too late for him to change in life. 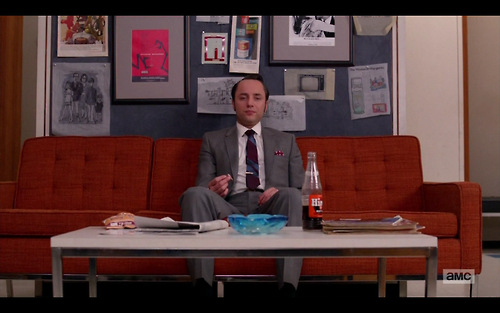 The last image of the episode is Pete Campbell smoking Stan’s joint in slow motion after having his tantrum against Joan snuffed out. Pete sees the world in the office changing, just as the characters (and we the viewer) see the entire outside world changing. The Chicago riots just exemplified the growing divide in America between generations—just as Ginsberg’s protests towards Jim Cutler exemplify the simmering divide in the office between the partners; as well as the generations within those walls. As Pete said last week, “there’s nothing else [he] can do,” so now he is going to smoke pot and most likely just try to get along. Though, I don’t expect him to change that much either. That is where we are in the Mad Men universe. There are 16 episodes left in the entire series. No matter if each week is good or bad, we have entered some serious territory—a place that veers from beautiful and true to chaotic from week to week. I’m perfectly fine with a show like that, as I continue to figure out how to better experience my own life.